Bio: Ali is a young longneck, presumably around the same age as Littlefoot. She’s kind and shy, but also a bit too trusting at times. She is part of a migrating herd of longnecks that visits the Great Valley from time to time. Bio: Archie is a toothless turtle that lives in a cave between the Great Valley and the Land of Mists. 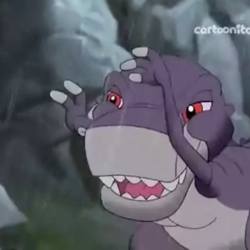 He’s quite nice and helpful to Littlefoot and friends when they get separated from each other after a great earthshake. Bio: Bron is Littlefoot’s father. He was seperated from Littlefoot’s mother and grandma and grampa longneck during the original earthquake during the first movie. Bron and Littlefoot reunited later during the Great Longneck Migration. Today he leads a herd of longnecks and wants Littlefoot to follow in his footsteps when he grows up. Bio: Like her father, Cera is brave, confident, strong, and loves to show it off. She can be mean and bossy at times, but she’s kind at heart. She rarely shows her soft side, but when she does, she’s sincere. She is loyal to her friends and doesn’t hesitate to help when she’s needed. Bio: Cera’s father has a giant ego. He always believes he’s right, but will sometimes yield to the decisions of Grandpa Longneck and the other Great Valley inhabitants if they all agree. He’s gruff, stern, and can come off as a bit mean sometimes, but he loves his daughter Cera deeply. Bio: Chomper was originally saved by Littlefoot and the rest of the gang when he was just an egg. 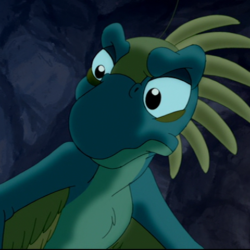 Because of this, he’s friends with them and helped them to avoid his parents in LBT 5: The Mysterious Island. His diet today consists of only bugs, but it’s presumed that he eat meat back when he lived with his parents. Now however, he lives with Littlefoot and co. in the Great Valley along with Ruby. Bio: Twin brother to Dinah, Dana is very playful and mischievous like his sister and he looks to his ‘Auntie Cerrie’ for help and support. Bio: Dill is somewhat on the annoying, evil side and quite nearsighted at that. She isn’t very smart, and always is looking for a reason to complain with Ichty. Bio: Twin sister to Dana, Dinah is just as mischievious, innocent, and playful as her brother. She looks up to ‘Autie Cerrie’ for help and assistance. Bio: Doc is a mysterious character that arrived right around the time Littlefoot and co. learned of the story of the “Lone Dinosaur” from Grandpa Longneck. Is it just a coincidence, or is Doc really the “Lone Dinosaur?” It’s never revealed, but the similarities are startling. Bio: Ducky is a sweet character that makes friends easily and always thinks of others before herself. She likes swimming and playing with her friends. Ducky is very out-going and positive and she always does whatever she can to help her friends. Bio: Very little is known about Elsie except that she has a kind heart and is willing to help out in any way possible. It’s hinted at that she might be looking for a partner as she shows a passing interest in Grandpa Longneck. Bio: Grandma is the ideal parental figure for Littlefoot–she cares about him, is highly protective and treats Littlefoot as if he was her own son. She’s the type of grandmother that everyone would love to have. 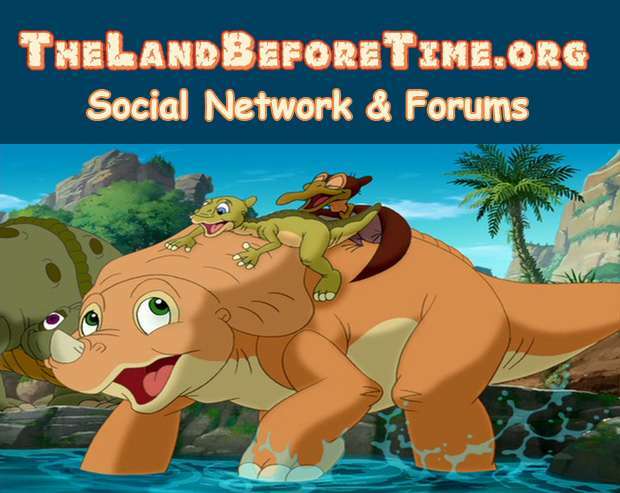 Bio: Littlefoot’s Grandpa is his grandson’s role-model throughout the series. If Littlefoot is ever confused about something, his Grandpa is the one he looks up to as his mentor. Grandpa Longneck is old and wise and is willing to take the lead when needed (just like Littlefoot). Bio: Hyp and his lackeys, Nod and Mutt are the typical teenage dinosaurs with the notion that they can do whatever they want. Hyp was considered to be a bully by Littlefoot. Hyp eventually learns that he is still very much a kid. Bio: Ichty and his partner, Dill are two meat eating dinosaurs that are partners out of necessity rather than true friendship. Dill is nearly blind and relies on Ichy to tell her where the food is. Then when she catches it, she shares a bit of it with Ichy. They don’t get along much, but they need each other so they stay together anyway. Bio: Our main character, Littlefoot is kind, honest, and quite smart. 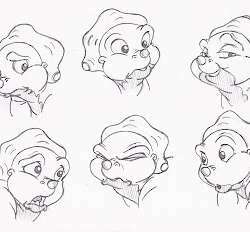 Littlefoot is often the leader of the group of friends–and he has qualities that make him an ideal one. Bio: Littlefoot’s mother is a loving, caring mother who ensures that her only offspring survives the treacherous land they roam. She sacrifices her own life to protect Littlefoot (and Cera) and is willing to do whatever it takes to protect her children. Bio: Mo is playful and kind, and is willing to do anything he can to protect his friends. Sometimes his jokes go a little too far and end up annoying those around him. Bio: Mr. Thicknose was once considered to be the most knowledgable of all the dinosaurs in the Great Valley. 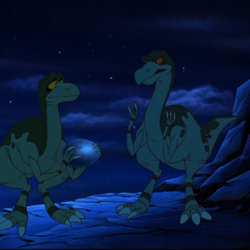 He is especially helpful to Littlefoot and his friends as they look for Spike. Bio: Mutt is certainly not the brightest of Hyp’s lackeys, and he is very gulliable and willing to follow other’s plans. Bio: Nod is one of Hyp’s friends and he really isn’t so much a bully-he just acts the part to be like Hyp. Bio: Ozzie is the bossy brother of Strut that would just like to eat a meal of eggs–if he could just lay his claws on some! Bio: Pat is an elderly Longneck with the know-how and wisdom to survive on his own as a loner and a wanderer. He’s very helpful to Littlefoot and co. and is the only longneck besides Brong and Grandma and Grandpa Longneck to try to help Littlefoot and co. when they were being chased by Sharpteeth. Bio: Petrie is a good friend. He oftentimes takes Cera’s side in things, but he’s loyal to Littlefoot as well. He hasn’t yet learned proper grammar, substituting “I” for “Me” and such, but he’s smart and quick and very honest. Bio: Petrie’s uncle, Pterano appears to be a deceiving, cruel, flyer, only thinking of himself and having little care for others. Deep down inside, Pterano finds the good in himself, and learns that there are more important things than power. Bio: The rainbowfaces (they have no names) are highly intelligent and very mysterious as they appear in the oddest of places and speak in riddles. Bio: Rinkus is not entirely bright having a lust for greed much like Sierra does. He was a partner of Pterano in their quest for a stone of cold fire. 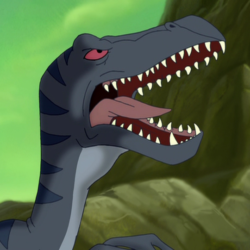 Bio: Rooter, an elder dinosaur, but full of wisdom gives Littlefoot a message that allows him to continue on searching for the Great Valley even though he is emotionally torn apart. Bio: The Sharptooth (from the original movie) was the Sharptooth that killed Littlefoot’s Mother. Next to nothing is known about him other than the fact that he was very powerful and met his demise at the hands of Littlefoot and co.
Bio: Shorty was first seen as a jealous, outcast, youth but Shorty is actually a very nice dinosaur. He was originally found by Bron along with a small group of young longnecks that he was protecting. He now travels with Bron and his wandering herd. Bio: Sierra, like Rinkus was a partner of Pterano looking for a stone of cold fire having a lust for power. Bio: Spike is slightly different from the rest of the group–he does not speak, rather he moans or hums. He’s often portrayed as the physically strongest of the group and he absolutely LOVES to eat. His love of food has caused more than a few problems for the gang, but Spike is a valued member and friend. Bio: Brother to Ozzie, Strut is rather dim-witted. He likes eggs, but is perfectly content munching on green food, much to the dismay of his brother. Bio: Very little is known about Sue except that she often felt bad about being so large. Thankfully she found a companion during the Great Longneck Migration that was even larger than her and now she’s happy. 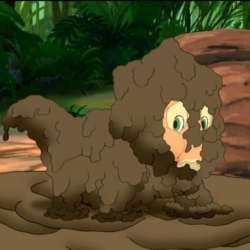 Bio: Tickles, while a small mammal has a large role: he saves Littlefoot and company from being dinner for Ichty and Dill. Bio: Tippy is a very young stegosaurus, but is very active and constantly running about. He too is hungry for green food though not so much as Spike. Bio: They may be small out the outside but they can have a hunger bigger than a long-neck. They hunt in packs, and have a nice little surprise for all brave leaf-eaters than enter their territory.